Feeling blocked? Yearning for more creativity in 2014? Join health coach Melissa Danielle and I for a free virtual Creative Cluster of The Artist's Way beginning Sunday, January 5th. 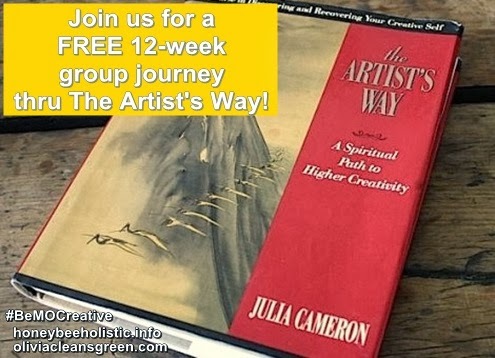 The Artist's Way is Julia Cameron's spiritual workshop aimed at freeing people's creativity. She describes it as "for anyone interested in living more creatively through practicing an art; even more broadly, anyone interested in practicing the art of creative living." Through her best-selling book, she's empowered millions of people to cultivate their creative selves. It takes about an hour a day to do the activities in the book, which are spread out over a 12 week period. Each week, you"ll begin by reading a chapter which focuses on an aspect of creative recovery. During the course, you'll begin each day with morning pages, three pages of flow-of-conscious writing to clear your mind. You'll also treat yourself to a weekly Artist's Date, a fun solo outing nurturing your creative, sensual self. There are eight other tasks to complete each week. While you needn't do all of the tasks, Julia Cameron recommends doing at least half. At the end of the week, there is a quick check in. Read why I'm doing The Artist's Way. Read why Melissa is doing The Artist's Way. Beginning January 5th, Melissa, I, and fellow creatives will meet live via Google Hangout for twelve Sundays 7pm-9pm, sharing our experience with the activities and supporting each other to nurture and embrace our creativity. In between, we’ll connect with each other in our private Facebook community. Each week, there will be a set topic to work on. Each of us will be responsible for completing daily assignments on our own time, and we’ll use the live weekly sessions and the online community to discuss the topic and set our intentions for the week ahead. How can you participate in our free virtual Creative Cluster? Buy or borrow a copy of The Artist's Way. (It's available here on Amazon starting at $10.99.) Also find a pen or pencil and a journal, notebook, or pack of loose leaf paper. Nothing fancy. Leave a comment and let us know why you'd want to do The Artist's Way. If you've already completed it, let us know if it's made a difference in your life.